The HTC One comes with a camera that's unique in the smartphone world. It's only the second mobile phone camera to be optically stabilized and it's the first to use a new design which involves photosites that are three times as big as those on a 12MP size. And since the sensor is equally sized to a 12MP sensor, it only gets to capture a third of the resolution. 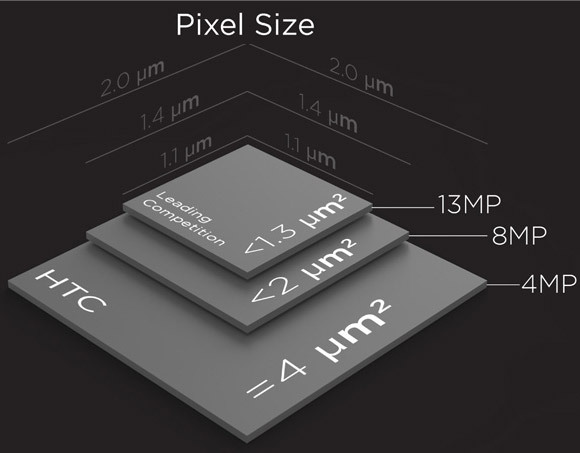 In HTC marketing talk these larger photosites are calls UltraPixels. The ultrapixels are bigger than you would get on all other current cameraphones. The Nokia N8 had 1.75-micron pixels, while the 808 PureView and the iPhone 5 both have 1.4-micron pixels. So, each pixel in the HTC One camera is twice the size of a pixel in the 808 and iPhone 5 cameras. Bigger pixels mean lower noise levels and usually, betery dynamic range. Low-light performance is also helped by the Optical Image Stabilization (OIS) as we saw on the Nokia Lumia 920. HTC has prepared this image to show how the One camera stacks up against competing smartphones. The sensor used in the HTC One has a 1/3" diagonal with a 16:9 aspect ratio and it's mounted behind a 5-element lens with F/2.0 aperture. The sensor takes photos with 2688 x 1520 resolution, which amounts to 4MP. HTC has included a second-generation ImageChip to process the images captured with the camera and also handle the needs of HTC Zoe. The HTC One continues the trend of using a unified camera interface for stills and video. We didn't like it all that much on the One X and its siblings and we have to admit we're not big fans of it now. Our biggest complaint - that you see a 4:3 viewfinder - even though you are shooting 16:9 content has been fixed mostly because the image sensor has a 16:9 aspect ratio and not 4:3. Before, you had to switch to 16:9 mode for the photos (dropping from 8MP to 6MP) just to get a proper viewfinder, which would allow you to frame your videos properly. Now things are quite the opposite - if for some reason you want a 4:3 photo rather than 16:9 the sides of the image get cropped out, giving you only 3MP resolution. Another complaint is that all still and video settings get dumped into one menu, instead of just getting the relevant settings depending on the current mode. Anyway, the camera interface itself is pretty simple - there are two shutter keys (one for stills and one for video), above them is the gallery shortcut and below is the effects button. On the left side of the screen you get flash mode selector and the Zoe toggle. Now, we already covered what Zoe does after you've taken a shot, here's how the actual shooting goes. You enable Zoe (an indicator at the bottom of the screen confirms you're in Zoe mode) and tap the still shutter key. The key turns into a progress bar, counting down the three seconds during which the phone records video, reminding you to stay relatively still. HTC is bragging that the camera can do burst shots at 8fps. But with Zoe you need to hold still for 3 seconds and that really negates the speed of the camera. The Optical Image Stabilization offers active correction of the image module in two axis with a frequency of up to 2000 times a second. That, combined with the F/2.0 aperture of the lens and big pixel promises good low-light performance. The MWC showroom floors are not ideal for image quality testing and we're away from our usual shooting locations. 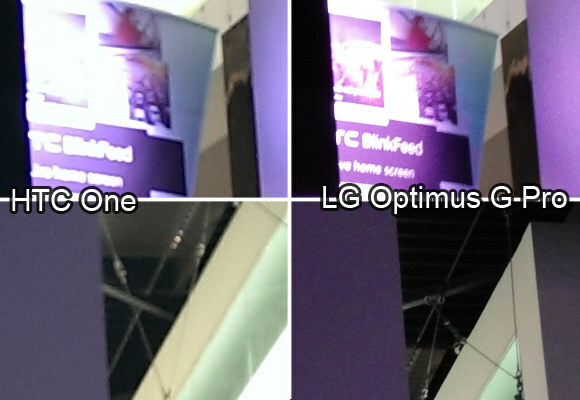 So, we grabbed an LG Optimus G Pro (which packs a 13MP camera) and took a couple of shots with both to see how the radically different sensor in the HTC One stacks up against traditional sensors. 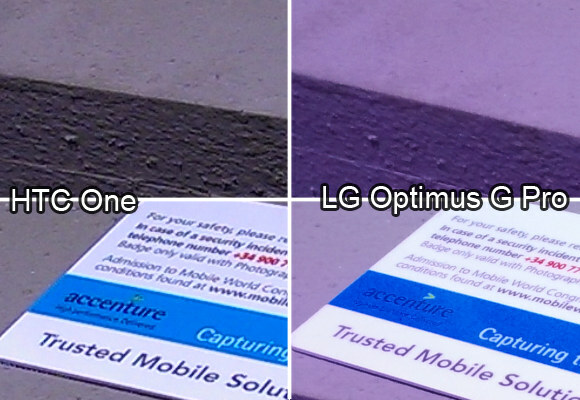 We prepared crops, with the Optimus G Pro photos downscaled to the HTC One's resolution. The first shot would be difficult even for a DSLR. In the MWC showroom are full of brightly lit company booths with patches of dim light in-between them. The Optimus G Pro photos have a lot more noise in them, while HTC One photos have a slight grain, but not too bad considering how dark the scene was. The One developed the shadows better (look at the ceiling), though the highlights are overexposed. Still, the HTC One has an advantage in dynamic range. The second shot gives us a peek at the resolving powers of both cameras when it comes to fine detail. The HTC One photos are sharper and pack more detail per pixel when we downscale the Optimus G Pro photos to the same resolution. But the low overall resolution is a problem - the text on the card is a lot easier to read in the 13MP G Pro photo than it is in the HTC One photo. The One produced a nicely balanced photo in terms of colors, even under the purple spotlight. The halos around most edges, however, reveal that the photo processing includes generous doses of artificial sharpening. And here are the full resolution shots we used to make the crops along with a few more HTC One camera samples. Obviously, we need to do more testing back in the office where we have more time and phones on hand to compare the HTC One against. What we can say right now is that the technology shows a lot of promise - it keeps noise relatively low and the detail per pixel is pretty good. The problem is that there aren't a lot of pixels to go around, which puts a hard physical limit on the smallest detail that the HTC One camera can resolve. As we saw, this could cause problems with things like text. The dynamic range isn't much better than that of traditional cameraphones either, so the large pixels didn't help too much here. At the end of the day, it depends on what you want to do with the photos. Most high-res 27" computer monitors are at under 4MP resolution and HDTVs are at 2MP, so the resolution HTC One photos is okay. But if you want to print out photos or crop into a smaller detail, 4MP may start to feel pretty tight around the neck. 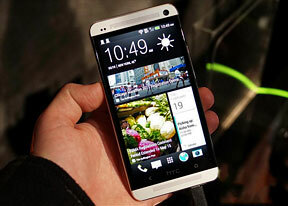 The HTC One can shoot videos at up to 1080p resolution at 30fps. It has an HDR option for the video, but note that the frame rate falls to 28fps, if you enable it. It also has high framerate recording modes, 720p @ 60fps and 68 x 432 @ 96fps. The camera features continuous autofocus and you have the option to lock the focus during video recording, if it triggers too often in dynamic scenes. The videos, of course, benefit from the Optical Image Stabilization as well. Videos are recorded in MP4 files with a whopping 20Mbps bitrate - the highest we've seen yet. Sound is captured in stereo with 192Kbps bitrate and 48kHz sampling rate. So, both video and audio codecs have plenty of bitrate to keep as much fine detail as possible. And videos indeed have plenty of detail and the noise is very low, especially considering that the lighting inside the showroom was not all that good. Sound is good too, despite the thousands of people around. Videos are a shaky though. There is some noticeable stabilization, but we feel the Nokia Lumia 920 would have produced a steadier shot.